I received a wonderful Christmas gift from one of my close friends. Knowing my love of all things WWII as well as my need for research items, she gave me a cookbook she stumbled on in a used bookstore. 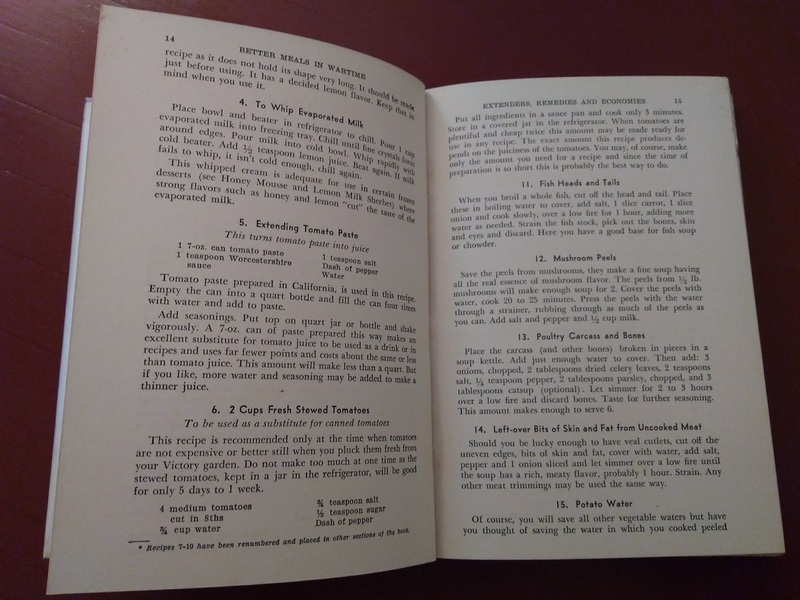 Better Meals in Wartime: The Point-Saver Cook Book was published in 1943 by Crown Publishers. Advertising itself to be "a simple, practical guide that shows how to prepare tasty and appetizing meals despite shortages, rationing and high prices," the book claims "this book will not solve all your food problems but it will help you to provide better meals now." What I found most fascinating is the first chapter called War Time Extenders, Remedies and Economies. 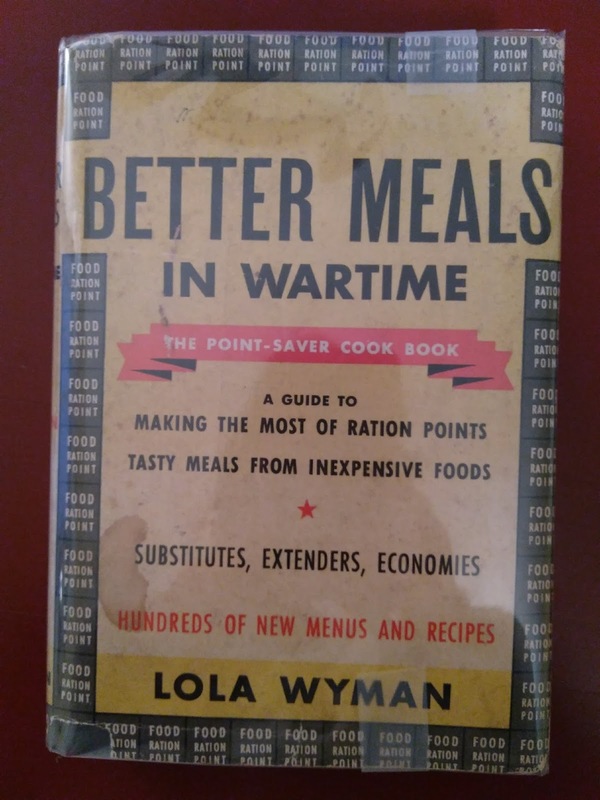 Author Lola Wyman whose credentials are not listed anywhere in the book or on the flyleaf writes as if she is talking directly to the home cook. She says, "I have experimented with 8 different methods of whipping light cream employing various commercial products, powdered vegetable gums, gelatin and lemon juice. Only the latter method is satisfactory." She provides advice on potato water (the water used to boil potatoes): "Of course, you will save all other vegetable waters, but have you though of saving the water in which you cooked peeled potatoes? This has splendid flavor. Simply add milk and seasonings and, if you have it, a cooked, mashed potato." Her section on Kitchen Catastrophes exhorts readers that "in these war time days it is more important than ever to avert kitchen catastrophes whenever possible. However, with the most careful attention, accidents may happen." She goes on to provide solutions for burned pans, gravy gone wrong, curdled sauces, burned cakes, and unsuccessful frosting. 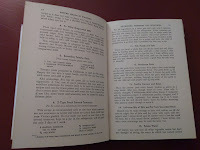 The introduction is three pages of "a variety of well-balanced menus. Each contains a suitable proportion of the necessary calories, vitamins, minerals, etc." But perhaps the best chapter is the one on leftovers. Not too imaginative, I usually just reheat the meal. 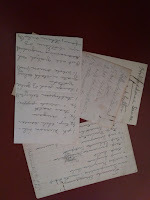 Ms. Wyman includes a two page index of a wide variety of leftover foods from bacon fat and fish to creamed vegetables. Taped inside the cover is a recipe cut from the Miami Daily News for Chocolate Ice Box Cake and tucked in between the pages are four index cards clipped together that contain recipes for French Dressing (dated 1937 and signed S. J. Kennedy, Ft. Meyers, Florida), and two copies of a recipe for Hollandaise Sauce. 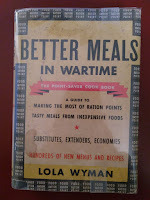 A true treasure, I can't wait to dig further into Better Meals in Wartime. What is your most special gift? WOW!! I would love this cookbook. 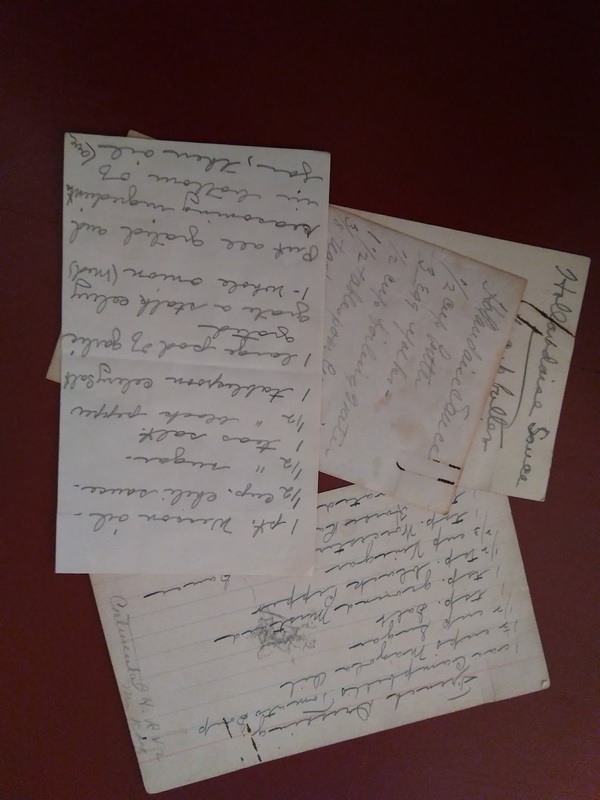 I inherited my mom's recipes that she wrote on index cards. I'm talking 100's of them. There is no way I can go through them all. Isn't it great? We also have my grandmother's Farm Journal cookbook. I love that you have your mom's cards. They are a treasure. These old cookbooks are amazing, aren't they? They really give us an insight into the times. My mom grew up on a farm and talked about how that made their life a little easier during the war because of being able to grow and raise so much of their food. I can't imagine killing a chicken! Thanks for stopping by. Hope you have a happy and healthy 2018.